I emphasize the word TREAT. These muesli bars are loved by my children and are a ‘sometimes recess’ in their lunchboxes. They are quite high in sugar and I usually need to include something else for their recess as the Lcm bars to really keep them going until lunch time. My kids certainly love showing them off to the other kids at school. These were definitely the bees knees in snacks to get in the lunch box when I was in school, although I think the sugar content now is very high and there are probably healthier things to get. That being said, my kids seem to love the taste of these (when I treat them on a rare occasion) when they don’t like other bars. 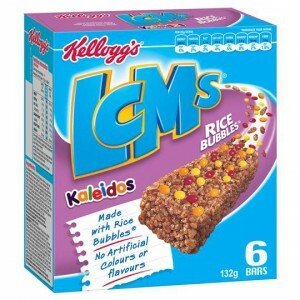 How would you rate Kellogg’s Lcm Coco Pops Kaleidos?